Pearlmutter, of Brookline, Massachusetts, will be teaching English in Brazil February through November 2018. Pearlmutter is fluent in Spanish and worked as a Spanish drill instructor at the University of Richmond, which she says has allowed her to help others develop their Spanish speaking skills outside the traditional classroom setting. “My philosophy is to employ a combination of repetition and active participation, all of which makes learning fun while still focusing on expanding vocabulary, reinforcing grammar and practicing verb conjugations,” she said. She is taking a Portuguese class this fall to develop speaking, reading and writing skills prior to arriving in Brazil, and says she is excited to use her skills to teach English there. She earned a Bachelor of Science degree in environmental studies with a second major in Latin American, Latino and Iberian studies from UR. 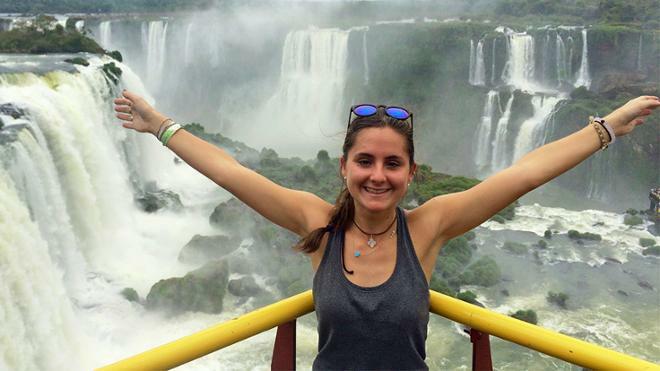 While at UR, Pearlmutter studied abroad in Buenos Aires. Following her Fulbright, she plans to attend medical school and pursue a career as a physician. “This Fulbright Scholarship will enhance my cultural competence and Portuguese-speaking skills, thus, allowing me to more effectively communicate with diverse patient populations,” Pearlmutter said.